The AEPA tests are composed of selected-response items, and some also include performance assignments. Information about the structure of each test is contained in the test objectives for the field. Test objectives are based directly on the Arizona rules and national standards (where applicable). For testing and score-reporting purposes, the standards are organized into subareas, objectives, and descriptive statements. Mapping the test objectives to courses taken is an activity designed to help candidates analyze their readiness to take a test in the AEPA program. It allows candidates to evaluate whether the coursework they have completed covers the knowledge and skills assessed. As a candidate for teacher licensure, you may wish to complete the following steps to aid in your test preparation. A sample completed worksheet is provided below. Obtain a copy of the test objectives for the appropriate Arizona custom test. Test objectives are available on this website. Select "Prepare," click on "Test Framework," and then select the field from the dropdown menu. 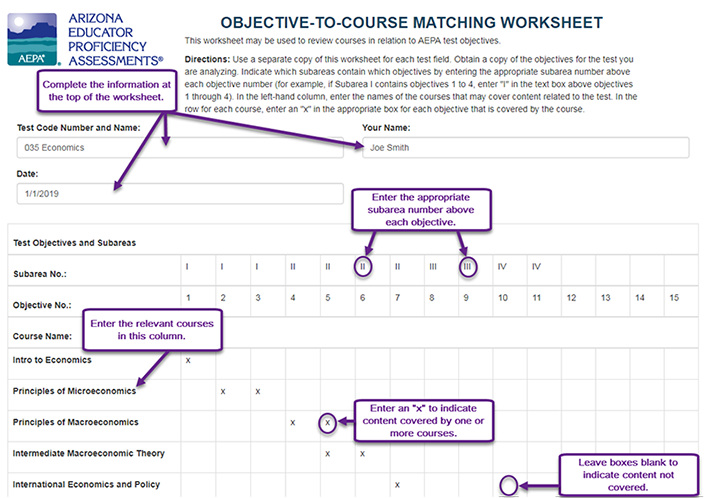 Obtain a copy of the Objective-to-Course Matching Worksheet. This worksheet is available on this website. Click on "Tests," select the appropriate Arizona custom test, and then click on "Preparation Materials." Enter the test code number and field name, your name, and today's date at the top of the page. You may complete this worksheet multiple times during your educator preparation in order to chart your progress in studying the material covered on the test that you are preparing to take. Review your records of the courses you have taken to date. Enter each relevant course in the designated column. Review each test objective to determine whether these courses covered the knowledge and skills identified by each test objective. You may wish to refer back to the test objectives, and use the associated standards for each objective to guide this activity. If the knowledge and skills tested by an objective are covered by the course, indicate so in the appropriate box. Leave boxes blank to indicate content not covered. See below for an illustration of how to complete the worksheet. When the worksheet is complete, you may evaluate your preparedness or ask your academic advisor to review the worksheet with you to determine whether you have completed sufficient coursework to be prepared to test. There is an image of a completed test objectives worksheet with annotated instructions on how to fill it out correctly. Users are instructed to enter the code and name of the test, their name, and the current date in the appropriate fields at the top of the worksheet. In the subarea number row, users will input the roman numeral of the subarea that corresponds to the objective number listed directly below it. In the course name column on the left, users will enter courses relevant to the test. In the row for each course, users are instructed to input an x to indicate if an objective was covered in that course. If an objective was not covered in a particular course, leave the box for that objective blank.